Andrew D. Smith completed a M.D. and Ph.D.in molecular and cellular biology at the Medical College of Ohio and a clinical diagnostic radiology residency and an abdominal imaging fellowship at the Cleveland Clinic. Prior to joining UAB, he was Associate Professor of Radiology, Vice Chair of Radiology Research, Director of the Medical Student Research Program, Director of the Clinical Investigator Pathway, Associate Director of the MD PhD program, Site PI for ACRIN, and a member of the Cancer Institute, Appointment Promotions and Tenure Committee, and Research Committee, among other institutional committees. 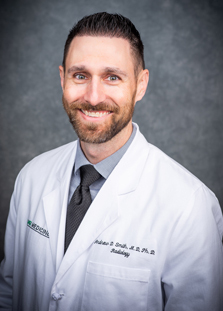 In 2017, Dr. Smith joined UAB Radiology as Associate Professor, Vice Chair of Clinical Research, Director of the Human Imaging Shared Facility (HISF), and member of the Comprehensive Cancer Center (CCC). As part of the HISF, he runs the Tumor Metrics Lab for the CCC. On a national level, Smith is a Fellow of the Society of Abdominal Radiology (SAR) and Fellow of the Society of Computed Body Tomography and Magnetic Resonance (SCBT-MR), and member of the Radiological Society of North America (RSNA), American Roentgen Ray Society (ARRS), American Society of Clinical Oncology (ASCO), American College of Radiology (ACR), ECOG-ACRIN, and SWOG. Dr. Smith serves on the SAR research committee, SCBT-MR research committee, RSNA GI research committee, ECOG-ACRIN GU Committee, SWOG GU Committee, ACR Appropriateness Criteria in GU Imaging, ACR Appropriateness Criteria Methodology Subcommittee Panel, and AUR Radiologist’s Radiology Research Alliance. Dr. Smith is an expert at noninvasive imaging biomarkers, has received multiple national awards and recognition for his clinical research and has multiple patents pending related to advancements in radiology. Dr. Smith has been a primary investigator on multiple grants (including several NIH small business grants), a co-investigator on multiple grants, and has served as a mentor in 17 student grants. Dr. Smith has run multiple retrospective and prospective clinical studies, including several multi-institutional studies, and he has mentored numerous students, residents, fellows, and research scientists and faculty. Dr. Smith has developed computer-assisted tumor response software that has been shown to reduce errors and improve efficiency and documentation in evaluation of metastatic disease response to therapy. He is currently integrating this software into oncologic clinical trials and working towards FDA approval. He is developing and validating several quantitative CT imaging biomarkers for use in oncologic treatment and chronic liver disease. Dr. Smith is a clinical scientist, inventor and entrepreneur. He serves as the Founder and President of Radiostics LLC, a core imaging lab focused on image interpretation and consultation for industry-sponsored clinical trials with imaging end points. He has several other start-up companies related to his intellectual property including eMASS LLC, Liver Nodularity LLC, and Color Enhanced Detection LLC. Dr. Smith’s clinical area of expertise is in body imaging (chest, abdomen and pelvis) and oncologic imaging (CT, MRI and PET imaging). His specific areas of emphasis are in metastatic disease response and renal cell carcinoma (cystic and solid) evaluation and response.